Susceptibility to sunburn is highly variable from person to person, with individual phenotypic characteristic playing an important role in someone’s risk for sunburn. People who have fair or light skin, blue eyes, and naturally blonde or red hair are at greatest risk for developing sunburn after UVR exposure. A measurement called the minimum erythema dose (MED) is used to assess someone’s susceptibility to sunburn, and is considered the threshold for sunburn. The MED is the lowest dose of UVR exposed to the skin that produces visible redness in the skin within 24 hours. On average, lighter skin types have a lower MED than darker skin types. People with lighter skin burn much more easily, while people with darker skin types tan more easily. Natural sunlight contains mainly UVA rays, along with a lesser amount of UVB. As the ratio of UVB to UVA increases, the risk for sunburn increases. 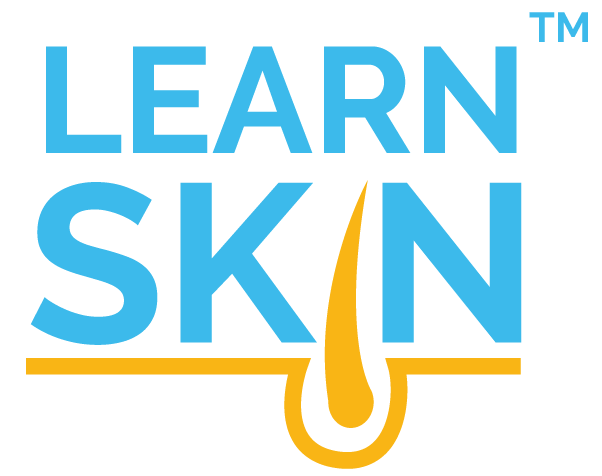 Biochemical and cellular changes occurs in the outer layer of skin (epidermis) during the sunburn response. First, the small vessels in the skin undergo vasodilation and skin cells called keratinocytes undergo cell death, called apoptosis. Visible redness occurs within 6 hours after exposure, and peaks between 12 and 24 hours as numerous inflammatory molecules and cells migrate into the skin. Some diseases can mimic sunburns, such as the classic butterfly rash that appears in people with systemic lupus erythematosus after sunlight exposure. Clinical manifestations of sunburn can range from mild redness to severe redness and blistering. A blistering sunburn indicates that a partial-thickness burn has occurred. In areas of sunburn, the skin usually becomes more sensitive to pressure and heat. Severe sunburns can be accompanied by headache, nausea, vomiting, and even fever. Redness from sunburn usually resolves within three to seven days, but blisters take up to 10 days to heal. Even after the sunburn resolves, some people may have residual brown spots, called solar lentigines. Certain skin care products, such as those containing benzoyl peroxide, alpha-hydroxy acids (AHAs), and retinoids can make the skin more sensitive to sunburn. The skin may also be at increased risk for sunburn following exfoliation use, microdermabrasion, or chemical peels. Some oral and topical medications can make the skin photosensitized and more susceptible to sunburn. 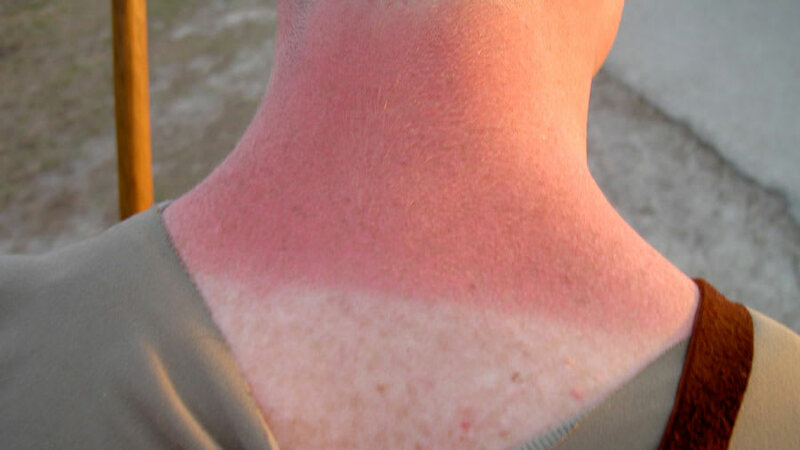 People taking photosensitizing medications may have an exaggerated sunburn reaction, consisting of burning, redness, and swelling in minutes after UVR exposure. Oral photosensitizing medications, such as doxycycline, antihistamines, furosemide, and many others can increase the risk for sunburn. Topical photosensitizing medications, such as benzoyl peroxide (an anti-acne treatment) can increase sun sensitivity. People living closest to the equator are at greater risk for sunburn, since this is where sunburn causing UVB rays are the most intense. Sunburn is most likely to occur around noon, rather than early morning or late afternoon. However, sunburn can still occur throughout the day. Snow can reflect up to 90% of sunlight, so people outdoors in the snow are at increased risk for sunburn, and people at higher altitudes are also at increased risk. Sand and water also reflect a moderate amount of sunlight, making the sunlight exposure more intense with a greater risk for sunburn. Wet skin is more susceptible to sunburn than dry skin. Wet skin tends to dissipate heat faster and this may serve as a false sense of protection. People with naturally light or fair skin, blue eyes, and red or blonde hair are at high risk for developing sunburn after UVR exposure. People with certain genetic mutations, such as those with Xeroderma pigmentosum, experience severe sunburns after only light sunlight exposure. There can be a few comments about concepts on how to improve the condition if that seems appropriate. Broad-spectrum sunscreen (offering both UVA and UVB protection) of SPF 30 or greater can prevent sunburn when used appropriately. Calamine lotion or moisturizers can help soothe and relieve pain. In sunburn with blisters, the area should be cleaned and covered with dressings soaked in saline or gauze with petrolatum. Oral nonsteroidal anti-inflammatory drugs (NSAIDs) can be taken to relieve pain and inflammation. People with severe sunburn may require hospitalization in order to replenish fluids and provide IV pain medications. Topical antibiotics, such as mupirocin or silver sulfadiazine, can be applied to sunburn induced blister to prevent infection. A diet rich in beta-carotene or taking natural carotenoid supplements may help prevent or alleviate sunburn after UVR exposure. Supplementation with omega-3 polyunsaturated fatty acids may protect against sunburn and reduce risk for skin cancer. More studies are needed to understand how omega-3 supplementation affects skin cancer risks. In order to prevent sunburn, it is important to seek shade at all times when outdoors and to cover as much skin as possible with protective clothing, such as long sleeves and hats. Broad-spectrum sunscreens with SPF of 30 or higher should be applied every day, and should be re-applied every two hours and after sweating. Artificial UVR exposure through tanning beds should never be used, as they do not protect against sunburn. Young AR. Acute effects of UVR on human eyes and skin. Prog Biophys Mol Biol.2006;92(1):80-85; PMID: 16600340. Chang YM, Barrett JH, Bishop DT, et al. Sun exposure and melanoma risk at different latitudes: a pooled analysis of 5700 cases and 7216 controls. Int J Epidemiol.2009;38(3):814-830; PMID: 19359257. Dennis LK, Vanbeek MJ, Beane Freeman LE, et al. Sunburns and risk of cutaneous melanoma: does age matter? A comprehensive meta-analysis. Ann Epidemiol.2008;18(8):614-627; PMID: 18652979. CDC. Sunburn and sun protective behaviors among adults aged 18-29 years - United States, 2000-2010. Centers for Disease Control and Prevention;2012. Cokkinides V, Weinstock M, Glanz K, et al. Trends in sunburns, sun protection practices, and attitudes toward sun exposure protection and tanning among US adolescents, 1998-2004. Pediatrics.2006;118(3):853-864; PMID: 16950974. Kochevar I, Taylor C, Krutmann J. Fundamental of Cutaneous Photobiology and Photoimmunology. In: Goldsmith L, Katz S, Gilchrest B, eds. Fitzpatrick's Dermatology in General Medicine. Vol 1: McGraw-Hill Companies; 2012. Ultraviolet Light. In: Bolognia JJ, Jorizzo JL, Schaffer JV, eds. Dermatology. 3 ed: Elsevier; 2012. Rhodes LE. The acute effects of ultraviolet radiation on the skin. In: Lim H, Honigsann H, Hawk J, eds. Photodermatology. New York: Informa Healthcare; 2007:75. Young AR, Guy RH, Maibach HI. Laser Doppler velocimetry to quantify UV-B induced increase in human skin blood flow. Photochem Photobiol.1985;42(4):385-390; PMID: 4089026. Harrison GI, Young AR, McMahon SB. Ultraviolet radiation-induced inflammation as a model for cutaneous hyperalgesia. J Invest Dermatol.2004;122(1):183-189; PMID: 14962107. Goorochurn R, Viennet C, Granger C, et al. Biological processes in solar lentigo: insights brought by experimental models. Exp Dermatol.2016;25(3):174-177; PMID: 26739821. Kim K, Park H, Lim KM. Phototoxicity: Its Mechanism and Animal Alternative Test Methods. Toxicol Res.2015;31(2):97-104; PMID: 26191378. Khandpur S, Porter RM, Boulton SJ, et al. Drug-induced photosensitivity: new insights into pathomechanisms and clinical variation through basic and applied science. Br J Dermatol.2016;10.1111/bjd.14935PMID: 27510322. Diffey BL. Sources and measurement of ultraviolet radiation. Methods.2002;28(1):4-13; PMID: 12231182. Moehrle M, Koehle W, Dietz K, et al. Reduction of minimal erythema dose by sweating. Photodermatol Photoimmunol Photomed.2000;16(6):260-262; PMID: 11132129. Mukamal KJ. Alcohol consumption and self-reported sunburn: a cross-sectional, population-based survey. J Am Acad Dermatol.2006;55(4):584-589; PMID: 17010736. Duffy SA, Choi SH, Hollern R, et al. Factors associated with risky sun exposure behaviors among operating engineers. Am J Ind Med.2012;55(9):786-792; PMID: 22692974. Lehmann AR. Xeroderma pigmentosum in the United kingdom. Photochem Photobiol.2015;91(2):484-485; PMID: 24943090. AAD. Sunscreen FAQs. www.aad.org/media/stats/prevention-and-care/sunscreen-faqs. Accessed August 15, 2016. Sunburn and solar erythema. In: James WD, Berger T, Elston D, eds. Andrews' DIseases of the Skin: Clinical Dermatology. 11 ed: Saunders; 2011:23-40. Lee J, Jiang S, Levine N, et al. Carotenoid supplementation reduces erythema in human skin after simulated solar radiation exposure. Proc Soc Exp Biol Med.2000;223(2):170-174; PMID: 10654620. Rhodes LE, Shahbakhti H, Azurdia RM, et al. Effect of eicosapentaenoic acid, an omega-3 polyunsaturated fatty acid, on UVR-related cancer risk in humans. An assessment of early genotoxic markers. Carcinogenesis.2003;24(5):919-925; PMID: 12771037. Miyamura Y, Coelho SG, Schlenz K, et al. The deceptive nature of UVA tanning versus the modest protective effects of UVB tanning on human skin. Pigment Cell Melanoma Res.2011;24(1):136-147; PMID: 20979596. El-Abaseri TB, Putta S, Hansen LA. Ultraviolet irradiation induces keratinocyte proliferation and epidermal hyperplasia through the activation of the epidermal growth factor receptor. Carcinogenesis.2006;27(2):225-231; PMID: 16123117. Li H, Gao A, Jiang N, et al. Protective Effect of Curcumin Against Acute Ultraviolet B Irradiation-induced Photo-damage. Photochem Photobiol.2016;92(6):808-815; PMID: 27514487. Xu Y, Sumei Y. Dermatology in traditional chinese medicine. St. Albans: Donica Pub. ; 2004. Russell JL, Wiles DA, Kenney B, et al. Significant chemical burns associated with dermal exposure to laundry pod detergent. J Med Toxicol.2014;10(3):292-294; PMID: 24526400. Shen D-H, Wu H-f, Wang N. Manual of dermatology in Chinese medicine = [Pʻi fu kʻo]. Seattle: Eastland Press; 1995. Cerovac S, Roberts AH. Burns sustained by hot bath and shower water. Burns.2000;26(3):251-259; PMID: 10741591. Maciocia G. The foundations of Chinese medicine : a comprehensive text for acupuncturists and herbalists. 2nd ed. / foreword by Su Xin Ming. ed. Edinburgh: Elsevier Churchill Livingstone; 2005. Pitchford P. Healing with whole foods : Asian traditions and modern nutrition. 3rd ed. Berkeley, Calif.: North Atlantic Books; 2002. Skrovankova S, Sumczynski D, Mlcek J, et al. Bioactive Compounds and Antioxidant Activity in Different Types of Berries. Int J Mol Sci.2015;16(10):24673-24706; PMID: 26501271. Eickhorst K, DeLeo V, Csaposs J. Rue the herb: Ruta graveolens--associated phytophototoxicity. Dermatitis.2007;18(1):52-55; PMID: 17303046. Furniss D, Adams T. Herb of grace: an unusual cause of phytophotodermatitis mimicking burn injury. J Burn Care Res.2007;28(5):767-769; PMID: 17667834. Schulz V. [Incidence and clinical relevance of interactions and side-effects of hypericum preparations]. Praxis (Bern 1994).2000;89(50):2131-2140; PMID: 11155496. Ossenkoppele PM, van der Sluis WG, van Vloten WA. [Phototoxic dermatitis following the use of Ammi majus fruit for vitiligo]. Ned Tijdschr Geneeskd.1991;135(11):478-480; PMID: 2023655. Inbaraj JJ, Kukielczak BM, Bilski P, et al. Photochemistry and photocytotoxicity of alkaloids from Goldenseal (Hydrastis canadensis L.) 1. Berberine. Chem Res Toxicol.2001;14(11):1529-1534; PMID: 11712911. Benhiba H, Hassam B. [Phytophotodermatitis due to Mentha rotundifolia]. Pan Afr Med J.2014;18:192; PMID: 25419319. Calka O, Akdeniz N, Metin A, et al. Phototoxic dermatitis due to Chenopodium album in a mother and son. Contact Dermatitis.2005;53(1):58-60; PMID: 15982237. Darvin ME, Sterry W, Lademann J, et al. Alcohol consumption decreases the protection efficiency of the antioxidant network and increases the risk of sunburn in human skin. Skin Pharmacol Physiol.2013;26(1):45-51; PMID: 23147451. Kreft S, Janes D, Kreft I. The content of fagopyrin and polyphenols in common and tartary buckwheat sprouts. Acta Pharm.2013;63(4):553-560; PMID: 24451079. Tavcar Benkovic E, Zigon D, Friedrich M, et al. Isolation, analysis and structures of phototoxic fagopyrins from buckwheat. Food Chem.2014;143:432-439; PMID: 24054263. Gomez-Bernal S, Rodriguez-Pazos L, Martinez FJ, et al. Systemic photosensitivity due to Goji berries. Photodermatol Photoimmunol Photomed.2011;27(5):245-247; PMID: 21950628. Stahl W, Sies H. Carotenoids and protection against solar UV radiation. Skin Pharmacol Appl Skin Physiol.2002;15(5):291-296; PMID: 12239422. Stahl W, Sies H. Bioactivity and protective effects of natural carotenoids. Biochim Biophys Acta.2005;1740(2):101-107; PMID: 15949675. Stahl W, Krutmann J. [Systemic photoprotection through carotenoids]. Hautarzt.2006;57(4):281-285; PMID: 16463037. Stahl W, Sies H. Photoprotection by dietary carotenoids: concept, mechanisms, evidence and future development. Mol Nutr Food Res.2012;56(2):287-295; PMID: 21953695. Feily A, Namazi MR. Aloe vera in dermatology: a brief review. G Ital Dermatol Venereol.2009;144(1):85-91; PMID: 19218914. Silva MA, Trevisan G, Hoffmeister C, et al. Anti-inflammatory and antioxidant effects of Aloe saponaria Haw in a model of UVB-induced paw sunburn in rats. J Photochem Photobiol B.2014;133:47-54; PMID: 24681774. Moehrle M, Dietrich H, Patz CD, et al. Sun protection by red wine? J Dtsch Dermatol Ges.2009;7(1):29-32, 29-33; PMID: 18673407. Dal Belo SE, Gaspar LR, Maia Campos PM. Photoprotective effects of topical formulations containing a combination of Ginkgo biloba and green tea extracts. Phytother Res.2011;25(12):1854-1860; PMID: 21520309. Ottinger H, Soldo T, Hofmann T. Systematic studies on structure and physiological activity of cyclic alpha-keto enamines, a novel class of "cooling" compounds. J Agric Food Chem.2001;49(11):5383-5390; PMID: 11714332. Herro E, Jacob SE. Mentha piperita (peppermint). Dermatitis.2010;21(6):327-329; PMID: 21144345. Kaur CD, Saraf S. In vitro sun protection factor determination of herbal oils used in cosmetics. Pharmacognosy Res.2010;2(1):22-25; PMID: 21808534. Bolfa P, Vidrighinescu R, Petruta A, et al. Photoprotective effects of Romanian propolis on skin of mice exposed to UVB irradiation. Food Chem Toxicol.2013;62:329-342; PMID: 24013074. Cole N, Sou PW, Ngo A, et al. Topical 'Sydney' propolis protects against UV-radiation-induced inflammation, lipid peroxidation and immune suppression in mouse skin. Int Arch Allergy Immunol.2010;152(2):87-97; PMID: 20016191. Petrova A, Davids LM, Rautenbach F, et al. Photoprotection by honeybush extracts, hesperidin and mangiferin against UVB-induced skin damage in SKH-1 mice. J Photochem Photobiol B.2011;103(2):126-139; PMID: 21435898. Olteanu ED, Filip A, Clichici S, et al. Photochemoprotective effect of Calluna vulgaris extract on skin exposed to multiple doses of ultraviolet B in SKH-1 hairless mice. J Environ Pathol Toxicol Oncol.2012;31(3):233-243; PMID: 23339698. Filip A, Daicoviciu D, Clichici S, et al. The effects of grape seeds polyphenols on SKH-1 mice skin irradiated with multiple doses of UV-B. J Photochem Photobiol B.2011;105(2):133-142; PMID: 21925895. Beasley DG, Meyer TA. Characterization of the UVA protection provided by avobenzone, zinc oxide, and titanium dioxide in broad-spectrum sunscreen products. Am J Clin Dermatol.2010;11(6):413-421; PMID: 20806994. Puvabanditsin P, Vongtongsri R. Efficacy of aloe vera cream in prevention and treatment of sunburn and suntan. J Med Assoc Thai.2005;88 Suppl 4:S173-176; PMID: 16623024.